We grow many of the flowers and vegetable plants we sell in our own corn furnace-heated greenhouses, but 0ur nursery also offers a large variety of hard-to-find perennials from Proven Winners and Sunny Border, medicinal, culinary, and decorative herbs, flowering and fruiting trees and shrubs from Pride’s Corner, raspberry, currant, and blueberry plants, and Weeks Roses. 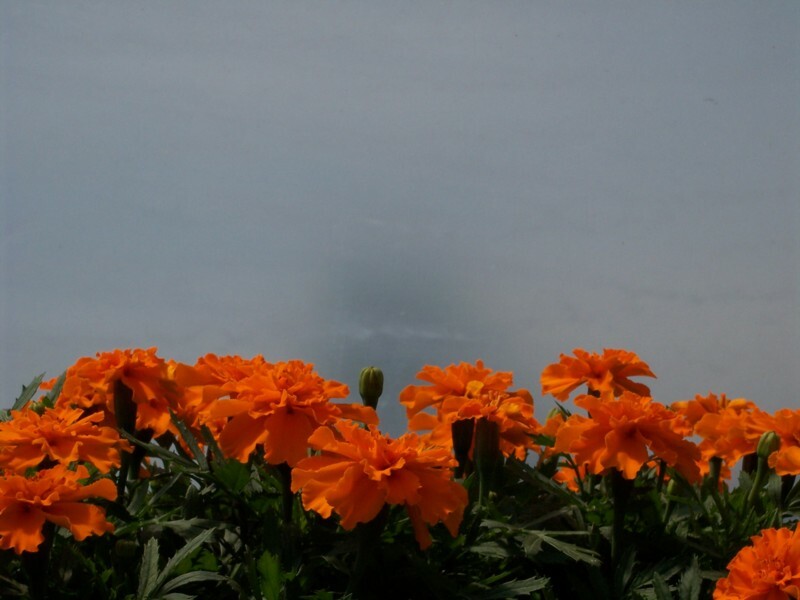 We know the challenges of gardening in deer country first-hand, so we also sell a large selection of deer-resistant plants. We offer gardening amenities as well, such as fertilizer, straw and bark mulch, Croswell Enterprises Dyna-mulch, bagged soil, seeds, pest repellents, and pots. Still don’t see what you want in our greenhouse? We’d be happy to order it for you. 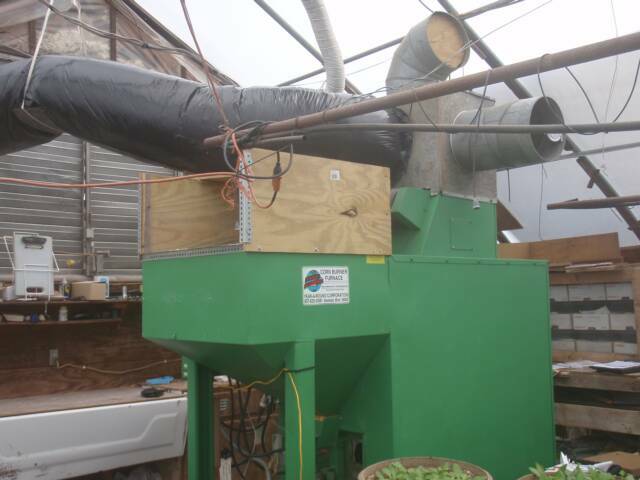 When we begin seeding bedding plants and vegetables at the end of February, this corn furnace heats just one greenhouse. As that greenhouse fills and more space is needed, some of the furnace's heat is ducted to the next greenhouse. By the time that one is full. it's nearly mid-March and the nights are noticeably warmer, and with a little help from oil furnaces on the coldest nights, the 1,000,000 Btu corn furnace can heat all three houses. 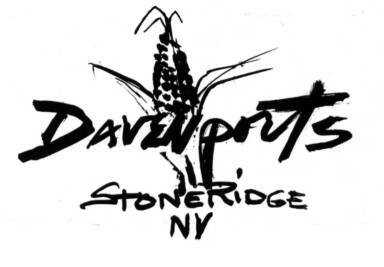 The fuel corn we burn comes from Hasbrouck Farm, which is right across the Esopus Creek from our farmland. Since installing this furnace in 2009, we've reduced the greenhouse's oil and gas consumption by about 75 percent. 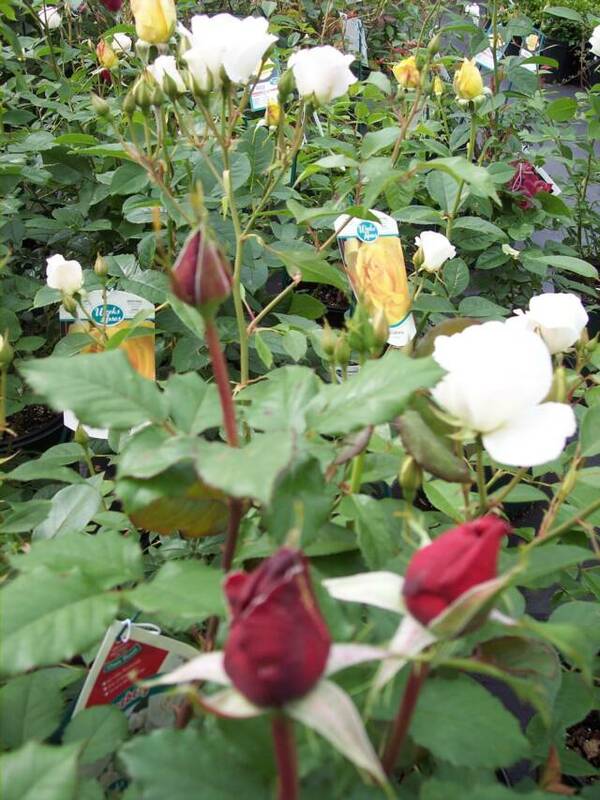 We've tried carrying roses from other companies, but Weeks delivers a broad selection and consistent high quality our customers can depend on. Weeks offers a wide variety of cultivars, including fragrant teas, hardy shrubs, and long-lasting climbers. 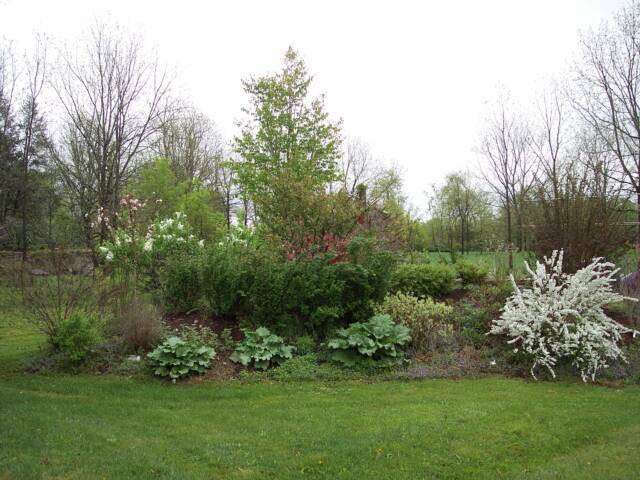 Plant damage from deer browsing is one of the most difficult problems facing gardeners in the Hudson Valley. Our large population of deer is due to more people moving into rural areas, decreased hunting, and abandoned farmland maturing into ideal deer habitat. To make matters worse, deer are very adaptive; that is, they can and will change their habits as their environment changes. This is a great survival characteristic, but it makes it particularly difficult to influence their eating habits. Deer are actually selective feeders and use considerable discrimination when they browse on plants. We need to take this factor into account when planning gardens. Try to choose plants deer are least apt to eat in areas they most frequently visit, and plant your favorites (and theirs) in protected areas. Whether or not a particular plant species will be eaten depends on seasonal factors, food availability, weather conditions, nutritional requirements, and plant palatability. When snow covers an already short feed supply, deer become bold and less selective, resulting in extensive damage to previously un-grazed species. While there is no such thing as deer-proof plants, try not to lose hope. And be sure to try some of the following suggestions. There are several strategies you can use to make your garden less vulnerable to deer damage. The three basic strategies are: 1. Physical barriers, i.e. fences and netting, 2. Using sprays and repellants, and 3. Choosing plants that have been proven to be least appealing to deer in your area. Traditional deer fencing is the most effective way to keep deer out, but it can be expensive to install, and unsightly in appearance. Another barrier method consists of hanging three rows of very strong monofilament (your basic fishing line) pulled tight around your garden perimeter at about one and a half, three, and five feet high. When deer walk into this stuff, they can’t see or understand it, so from then on, they’ll route around it. This type of fence is high-maintenance. If there’s a break in it, the deer will find it. If this fence becomes damaged, please don’t leave it there—collect all the line and dispose of it properly, as it can be a danger to all kinds of wildlife. Also, don’t put this type of barrier in the path of high-speed children. There are many effective repellents commercially available. Our customers seem to get good results from Liquid Fence. Be sure to read the label for dilution and frequency of application information. To find the best value among them, check the ratio of mix to water, because while one brand may seem more expensive, it may in reality go a lot further than cheaper brands. Some of these products may need to be reapplied after a rain. There are also many home recipes worth trying as well. Some are as simple as mixing an egg with soap and water. I found the following deer repellent recipe in FINE GARDENING magazine: In a kitchen blender, drop two eggs (shells and all), one or two cloves garlic (or garlic powder), one tablespoon chili powder or red pepper, and two cups water. Blend until everything is liquefied. Pour this mixture into a gallon plastic bucket that has a cake of yellow laundry soap (such as Fels Naptha) in it, fill with lukewarm water, and stir. Carry this out to the garden and splash it over plants by dipping a rubber-gloved hand in and shaking it over them, or by touching things deer love, such as day lily buds. Reapply every week or two depending on rainfall and deer pressure. Once it dries, it has no smell to humans, but obviously it’s repulsive to deer and certain other animals and insects; perhaps due to the sulfurous combinations of egg and onion. Hostas seem to be an all-time favorite deer nibble. For most people the hostas most frequently eaten are green leaf or green and white variegated. Try some of the varieties with heavy puckered leaves, as deer seem to dislike it. I noticed in my own garden that deer ate all of the green Royal Standard hostas (a very common green leaf type), but picked around all of my favorite varieties, such as Sum and Substance, France William, and Krossa Regal. I wouldn’t add any of these plants to the above list, but if you’re a hosta lover in deer country, they may be worth a try. Milorganite is composted, dehydrated human sludge that is marketed as a fertilizer but has the added benefit of being a deer repellent. To a deer, it smells like humans, which in deer minds, equals trouble. Additionally, rain, which often washes away other repellents, serves to bring out its scent. Perfumed bar soap hung from branches is a tried-and-true tactic. Another approach is putting a radio in your garden tuned to an all-night chat show. The deer hear a conversation and stay away. You can also try wiring a radio to a motion-sensing light (available at Marbletown hardware). The radio will only come on at night when it senses movement. Because deer have such good hearing, the volume can be set low. If an all-night chat show doesn’t seem to work, you may need to get a continuous recording of Rush Limbaugh to play. That’s rash, I know, but desperate times call for desperate measures. Remember, keeping deer out of your garden is an ongoing task that takes trial, error, and perseverance. You must change your tactics as the seasons and deer habits change. Every garden situation is different, so there is no one best solution. Visit the deer-resistant test bed at our nursery. 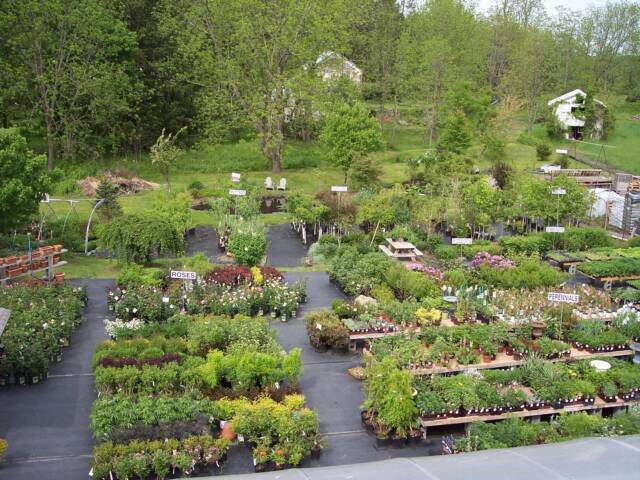 Our nursery features a large variety of perennials, shrubs and landscape trees. 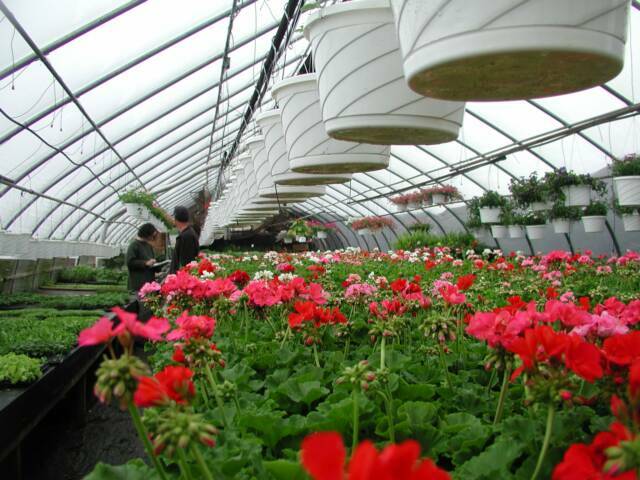 We start up the greenhouses in late Feburary, and the plants begin to arrive at the farmstand in mid-April.